If there’s an indoor or outdoor home improvement project on your “to do” list, it’s just about time to get started. You’ll be able to kick start your project at the 2019 Colorado Garden & Home Show, coming Feb. 9-17 to the Colorado Convention Center in downtown Denver. The event is notorious for being one of the largest of its type and this year will be no exception. With about 1400 booths representing more than 650 companies, you’ll be sure to find an expert to talk to about landscaping, gardening and every kind of home improvement. The 2019 Colorado Garden & Home Show is one of those events that you’re going to want to spend a lot of time at, either with a marathon single visit, or since the show will be going for nine days, with multiple visits. We’d like to help make your show experience a smooth one; here’s some basic information that you may find helpful. Sat. Feb. 9 --- 10 a.m. to 8 p.m.
Sun. Feb. 10 --- 10 a.m. to 6 p.m.
Mon. Feb. 11 through Thurs. Feb. 14 --- Noon to 7 p.m.
Fri. Feb. 15 --- Noon to 8 p.m. Sat. Feb. 16 --- 10 a.m. to 8 p.m.
Sun. Feb. 17 --- 10 a.m. to 6 p.m. The Colorado Convention Center is located at 700 14th St. in Denver. There are 1000 parking spaces onsite and you can park for up to eight hours for $12. Three parking spaces for electric or hybrid vehicles are available for free on a first come first served basis. Alternatively you can park at Broncos Stadium at Mile High (Lot C) for $5 and then take a free shuttle to the convention center. There will be about 40 seminars, free with paid admission, taking place in the show’s Education Theater located at the end of Aisle 1100. Noon --- Best Management Practices for Earth-Friendly Gardening and Basic Garden Maintenance. There will be a limited number of wheelchairs available at the show; borrowers will need to show an ID. Strollers will not be available onsite but you can bring your own. A coat check will be available on Friday, Saturday and Sunday only. There will be multiple options for food and drink. Cameras and video recorders are allowed except at booths with posted “no photography” signs. 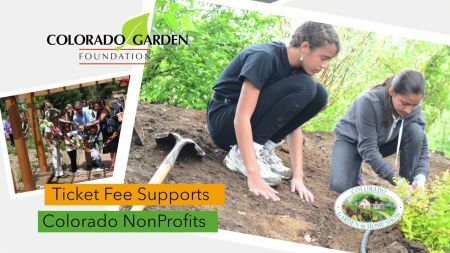 For more information on the 2019 Colorado Garden & Home Show go here.